Seattle’s new set of solid waste contracts focus on alternative fuels and introduces electric vehicles in its fleet. 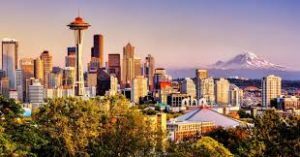 SEATTLE – The Emerald City’s latest set of solid waste collection contracts continue its commitment to using cleaner burning fuels. They also push two large companies – Recology and Waste Management — one step closer toward an electric-powered fleet. “It’s an exciting opportunity for all of us,” said Hans Van Duzen, Seattle Public Utilities’ contracts manager, as he presented the new agreements to the Seattle City Council’s Committee on Civil Rights, Utilities, Economic Development and the Arts last month. Continuing Seattle’s existing relationship with Recology and Waste Management, the new solid waste collection contracts of contracts are scheduled to run March 2029 and are worth an estimated $850 million. This represents a $5 million savings from the city’s current set of contracts with these two companies that will expire in March 2019. The new set of contracts keep the two companies’ territories the same as the previous contract, with Recology covering the city’s northeast and central sectors and Waste Management covering its northwest and southern sectors. Both companies will also continue to offer the same schedule of services as the previous contract with one exception: Van Duzen said he’s working on language allowing consumers to cut their garbage collection service down from once every week that his office would flesh out later. The new set of contracts also tighten the rules Recology and Waste Management must follow with regards to the vehicles each company its fleet. In addition to requiring Recology and Waste Management use new vehicles from the 2018 or 2019 model year that surpass the latest emission standards, the contracts also dictate these vehicles must run on 100% renewable fuels that don’t contain any petroleum products. Waste Management will meet this criterion by using vehicles powered by natural gas that has been certified renewable by the Environmental Protection Agency. Van Duzen said Waste Management would purchase this fuel using credits the company earned collecting natural gas emitted by its landfills and converting it into fuel. He added the company has already started accumulating these credits in anticipation of their use with a natural gas fleet. Meanwhile, Recology will satisfy its requirement by using 100 percent renewable diesel that is free of esters and produced using renewable feedstock like rendered animal fat and used cooking oil. The city’s contract also specifically bars the company from using renewable diesel produced from palm oil, likely because of palm farming’s links to massive deforestation in Southeast Asia. Both companies must also make sure their new fleets contain a significant number of electric-powered vehicles. Waste Management’s new 100-vehcile fleet must include six electric powered pickup trucks and two medium-duty street crew trucks, while Recology’s 100-vehcile fleet must include at least three electric-powered support vehicles and at least two medium-duty trucks. Recology must also deploy one electric-powered, heavy-duty collection truck when the new contract starts in April 2019 and, pending a performance review, a second electric-powered, heavy-duty collection truck by April 2020. The city has agreed to pay Recology $200,000 for each heavy-duty truck it deploys once that deployment becomes permanent. Van Duzen noted some council members including Lisa Herbold, who chairs the Civil Rights, Utilities, Economic Development and Arts Committee, had wanted to see more electric-powered vehicles on the road. But he said these vehicles still have challenges when it comes to their capacity, hydraulics, service reliability and their ability to climb the steep hills Seattle is known for. “The market isn’t there yet,” he said, hinting the city may push for the deployment of more electric-powered, heavy-duty vehicles as the technology improved and the market was able to meet its demands.